A guide from Far and Wild Safaris will collect you from your overnight accommodation in Durban or from the King Shaka (Durban) International Airport and travel via the Natal Midlands to the extraordinarily beautiful and geographically diverse Nambiti Private Game Reserve, home to elephant, lion, leopard, buffalo and rhino (including the rare and endangered Black Rhino), as well as over 30 other animal species. It is also rich in birdlife and indigenous flora. Unlike most other game reserves, the Nambiti Private Game Reserve has the carrying capacity of almost twice that of wildlife regions such as Botswana, thus being able to carry more game per hectare than many other game reserves. Knowledgeable guides will plan a safari that takes into account your particular interests and requirements. We will plan to arrive at our lodge in time for lunch, but this is only possible if your arrival flight into Durban allows for this. Dinner is waiting for you at your lodge's boma or in a surprising bush location upon your return. Today we follow the lodge programme, which usually includes a morning game drive, breakfast, sometimes a guided walk (which is optional), lunch, afternoon tea followed by the evening game drive and dinner. Game viewing here is very good, and generally close up sightings of the animals are experienced. After our morning game drive and breakfast in this very productive private game reserve, we leave and head for Durban, arriving in the early afternoon. Upon departure, we may also visit the nearby Kwa Cheetah Breeding Project. Kwa Cheetah plays a big role in the rescue and release of other animals and smaller cat species, these include the likes of Serval, African Wild Cat, Meerkat and some other orphaned or injured animals. These are all raised and released onto the reserve. Kwa Cheetah allows only one public interaction per day as not to put any unnecessary stress on their animals, and this facility is not open every day of the week. These interactions include an educational talk exposing guests to the vulnerability of cheetahs and their future plight - guests get the chance to see their cats run in the running area and of course get to interact with most of the cats. Cheetah Ridge Manor House has a 2 roomed family suite in the main lodge, with 10 x free-standing rooms overlooking a waterhole in the Nambiti Game Reserve. Child friendly, securely fenced grounds with swimming pool, tennis court and games room. Cheetah Ridge Manor House is fully hosted and catered for with guided game drives in ‘open’ safari vehicles, late afternoons into the evening and early mornings. Elephant Rock Lodge is a charming boutique safari lodge overlooking a waterhole, set high on the sides of a hill in the Nambiti Private Game Reserve, offering luxury accommodation for up to 10 guests. One of the units is suitable for a family, with the two rooms adjacent and interleading. Swimming pool, view decks with daily guided game drives in the mornings and afternoons into the evenings in the excellent Nambiti Game Reserve. Esiweni Lodge, a 4 star game lodge in the Nambiti Game Reserve, Ladysmith, KwaZulu-Natal, Esiweni has a unique cliff top position offering guests a dramatic view over the Sundays River. Esiweni is located in the northern sector of the Nambiti Game Reserve offering guided game drives, it is a fully catered for venue. The five star Lions Valley Lodge is situated in the central sector of the Nambiti Private Game Reserve, the main lodge offers numerous public rooms for guests, a variety of dining venues, an integrated covered Boma, a large rim-flow swimming pool which looks out over a large water-hole. The Main Lions Valley Lodge and its 10 scattered suites are all brick under thatch. Guests are taken in golf carts to the more distant rooms. All meals and a full guided game viewing program is included. Nambiti Hills Private Game Lodge offers Five Star accommodation and is located within the Nambiti Private Game Reserve. Nambiti Hills is an ideal venue for guests seeking privacy, romance or a luxurious base from which to searching for the Big Five on the guided open vehicle game drives. Located on a hill-top in the southern sector of the Nambiti Game Reserve the Lodge and rooms have elevated views out over the rolling hills of the Nambiti Game Reserve. Nambiti Plains Lodge is situated amongst the indigenous bushveld within the Nambiti Private Game Reserve, which is located close to Ladysmith in KwaZulu-Natal. The panoramic outlook and nearby water-hole offer guests excellent game viewing from the comfort of the lodge deck. The rooms all have private decks looking out into the game reserve. The guided game drives from the Lodge are included in the lodges daily program. Ndaka Safari Lodge has 6 super Luxury Safari Tents with views out over the Nambiti Plain in front of the Lodge, each tent with an entrance foyer, large lounge, a double bedroom, private bathroom with bath and large shower and separate toilet en suite. The tents are air-conditioned. Guided game-drives on Nambiti Game Reserve are included. Springbok Lodge in the Nambiti Game Reserve, offers beautifully appointed air-conditioned tented suites, excellent service, superb cuisine and prolific wildlife. Views from each tent allows guests expansive views of the bushveld and often a passing parade of wildlife beyond the fenced boundary. 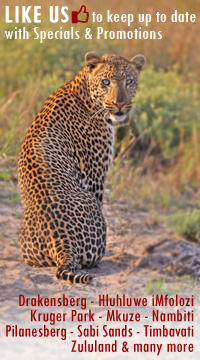 Guided game drives in open safari game viewers are conducted each morning and afternoons into the evening. Meals are enjoyed on the deck, in the dining room or alfresco in the Boma. Umzolozolo Private Safari Lodge is a five star venue situated in Nambiti Private Game Reserve, KwaZulu-Natal. This reserve is close to Ladysmith and easily accessed when travelling from Johannesburg or Durban. Umzolozolo has a variety of room types from the impressive Presidential suite, the Honeymoon suite to the Luxury rooms and family suite. Delightful cuisine, excellent staff and interesting guided game drives make Umzolozolo a popular venue within the Nambiti Game Reserve.